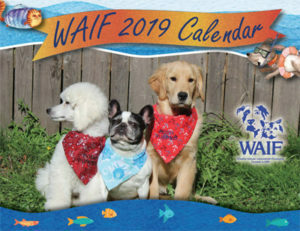 For only $12, purchase a WAIF 2019 calenda r today! Proceeds of calendar sales go to help homeless dogs and cats of Whidbey Island. A great gift for the animal lovers in your life. At our annual Spring Fling Auction & Dinner, guests place winning bids to have their pets showcased throughout the calendar showing the incomparable bond between owners and their pets. Animals do make a difference in our lives! Calendars are $12 each with $2.95 shipping & handling. Additional calendars in the same shipment will incur a $.50 shipping & handling charge each. Supplies are limited! Please allow 5 – 7 days shipping. $2.95 shipping and handling for the first calendar $.50 for each additional calendar.